Stepping onto the gang plank, a fresh wave of sorrow washed over him. So much grief; so much sorrow. How much can one man endure? Tears formed like small pools at the bottom of his eyes. Once the dam broke, there would be no stopping the flood that was sure to follow. Thinking back over the past two years, Horatio Spafford had endured so much pain in his life. First, losing his son to a tragic death and then losing most of his investments to the great Chicago fire of 1871. And now, he was headed to England to join his sweet Anna in saying goodbye to their four daughters who had died tragically at sea. With a sigh, Horatio headed to his cabin. It was just over a week ago that Horatio bid Anna and his daughters bon voyage as they sailed to England. He had every intention of traveling with them but a last minute business deal came up causing him to stay in the states a few extra days. His new plan was to meet up with the girls in England where they could work at putting the tragedies of the last couple of years behind them. It was to be a festive occasion; one where they could get a much needed rest. Never could he have imagined that he would be saying a final goodbye to his sweet little girls. 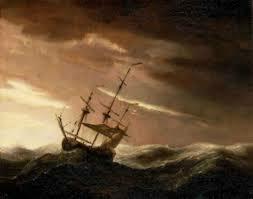 Several days into his voyage, Horatio was summoned to the bridge by the Captain. With deep sadness, the Captain shared that, after careful reckoning, he believed they were approaching the site where the ship carrying his wife and daughters had sank. Looking out across the vast watery grave, with the spillway to his tears opened, Horatio said a final goodbye to his girls.